BACKTOFRANKBLACK.COM: Thomas J. Wright Week - Wednesday: "Out of Chaos Comes Awareness"
Thomas J. Wright Week - Wednesday: "Out of Chaos Comes Awareness"
What comes after someone survives a terrible and terrifying event? What truths or new perspectives follow in the wake of pure, blood-pumping terror? In other words, “Powers, Principalities, Thrones and Dominions” concerns awareness in general, and specifically Frank’s dawning awareness of a Cosmic Order outside the ken of mankind. This awareness comes to him only after an extended and painful period of self-doubt and grief. But ironically, awareness would also not be possible without that self-same period of self-doubt and grief. Penned by Ted Mann and Howard Rosenthal, and superbly directed by Thomas J. Wright, “Powers, Principalities, Thrones and Dominions” thus finds the series’ lead protagonist, Frank Black at his lowest and most world-weary ebb and then – surprisingly – opens his eyes to an unseen world; the world of angels, demons and cosmic hierarchies. The title of the episode itself indicates the nature of those cosmic schemes or hierarchies. According to some Biblical scholars, “Thrones” are living symbols of God’s justice and authority, “Dominions” are beings who regulate the lower angels, “Powers” are the bearers of conscience and keepers of history and “Principalities” are the educators and guardians of the realm of Earth. Or contrarily, “Thrones,” “Dominions,” “Powers” and “Principalities” may be the categories of evil Minions existing on Earth; the twelve principalities of Satan, for instance (death, anti-christ, covetousness, witchcraft, idolatry, sedition, hypocrisy, disobedience, rejection, hypocrisy, etc.). Similarly, in Ephesians 6:12 the apostle Paul wrote: “For our wrestling is not against flesh and blood, but against the principalities, against the powers, against the world-rulers of this darkness, against the spiritual hosts of wickedness in the heavenly places.” This was the author’s manner of suggesting that anti-God, malevolent forces existed in places of state, in places of Empire, in places of government. Thus, in pondering this episode of Millennium, we (along with Frank) find ourselves plunged into a war involving supernatural beings on Earth. On one hand are angel-like agents of God such as Sammael, who seems a “guardian of the realm of Earth.” On the other hand is Alesteir Pepper, a man of worldly wealth and power and perhaps, actually, a demon. Even Aleister’s name suggests evil, as he jokes with Frank, making an almost-cryptic allusion to the notorious poet and Satanist mystic, Aleister Crowley (1875-1947). In terms of Millennium history, “Powers, Principalities, Thrones and Dominions” plays tonally almost like the epilogue or coda of “Lamentation,” and represents one of the earliest instances in the Carter series of direct supernatural involvement in human affairs. To recap, in “Lamentation,” Frank’s family is threatened by Lucy Butler, and his best friend, Bob Bletcher (Bill Smitrovich) is murdered in Frank’s own sanctuary, the yellow house where Frank tries in vain to “paint away” the darkness in life, per the words of series creator Chris Carter. As “Powers, Principalities, Thrones and Dominions” opens, Frank grapples heavily with the death of “Bletch” and the invasion of his yellow sanctuary. Accordingly, the episode’s dialogue continuously maps Frank’s sense of world-weariness, confusion, and diffidence. “I’m not ready to come back to work yet,” he tells Peter Watts with resignation during one phone conversation. The unspoken ending to Catherine’s last sentence is no doubt an allusion to Frank’s nervous breakdown; the last time he lost his grip on his identity and his true, best self. Catherine clearly fears the same thing could occur again if Frank doesn’t find his emotional footing. Interestingly, when Frank is confronted by Pepper, a man who may be a demon, he notes – in maddeningly ambiguous tones – that “you’ve come to me before.” This seems an implicit suggestion that Frank’s previous mental breakdown arose as a result of the works of a demon, even, perhaps, the Devil himself. Only now – upon recognizing the demon again (although perhaps in a different form) – does Frank understand what he is really battling. Admirably, director Thomas J. Wright’s selection of compositions during the early portions of “Powers, Principalities, Thrones and Dominion’s” echo Frank’s crisis; his sense of uncertainty about himself, his gifts, and the nature of the world around him. Thanks in large part to these shot choices death itself seems to oppress Frank in this episode, like an anchor pulling him down farther and farther. To augment this perception of a man overwhelmed and oppressed by death, Wright stages shots of Lance Henriksen visually entrapped between support beams in Frank’s basement (the site of Bletch’s murder). This mise-en-scene limits Frank’s space in the frame and creates, in essence, a visual “cage” around the character. Director Wright – a veteran of such programs as Beauty and the Beast, Otherworld, Dark Skies, and Nowhere Man – also frequently positions Frank underneath heavy stone archways or obscured behind objects in the frame. These choices by Wright in general reinforce the lugubrious or heavy nature of the story, of Frank “denying who he is,” in the words of his wife, Catherine, and feeling defeated and overwhelmed by recent, tragic events. At about the ten minute point of the episode, for instance, in the scene that finds Frank and Peter Watts discussing Sammael, Wright even positions Frank behind two coffins in the foreground, a visual indicator that death is foremost on his mind, and occluding, again, his space or freedom in the frame. Another moment, early in the episode, also expresses Frank’s conflict. He gazes at his reflection in a bathroom mirror, and the idea, expressed by the director’s selection of angles, is that he is battling himself, (his reflection); battling his sense of doubt and uncertainty. As the episode continues and Frank is drawn further into the seemingly unconnected case of a murderer named Martin, the profiler continues to flash on mental images of Bletch’s murder. But instead of denying the connection to the event that consumes his mind, Frank begins to explore it more fully. This is Frank’s perennial strength, his ability to face the darkness head on. Soon, he is listening to his visions instead of trying to dismiss them as symptoms of trauma or stress. Again, Thomas J. Wright cannily finds exactly the right visuals to suggest Frank’s restored confidence. 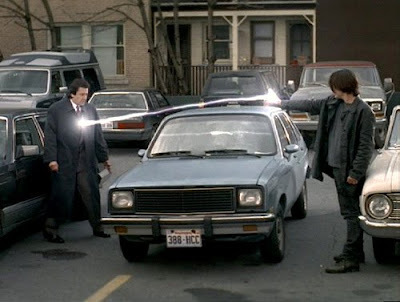 When, during the climax of the episode, Frank witnesses a parking lot confrontation between a diabolical attorney named Aleister and a stranger – really the “angel of death” Sammael, for instance, Wright presents two competing visions of the conflict in fast succession. In the consensus view of reality, Sammael is armed with a gun and fires it at Pepper at point blank range. But in Frank’s personalized, insightful view of the event, a kind of supernatural energy beam is emitted from Sammael’s palm and strikes the demonic lawyer. These rapidly alternating views of the same event make the audience aware that Frank again has confidence in his insights. He sees the event for what it is: a supernatural assassination; one of God’s agents (Sammael, who in literature is sometimes good and sometimes evil) “binding” and defeating an agent of Satan, Aleister Pepper. Likewise, when Frank disarms Sammael after the confrontation, Wright’s camera adopts a low angle perspective, one that in cinema history traditionally represents power or strength. Frank and Sammael – again, an angel or supernatural creature of some variety – share a tight two shot, as Frank puzzles over the gun. Both the perspective and the staging reveal Frank’s intrinsic strength. Visually, he is on equal footing with the angel in this case. The shot selection thus makes one wonder if Frank is actually a critical part of God’s hierarchy as well. Like a “Throne” is a symbol of “justice” and like a “Power” is a force of conscience, so thus is Frank himself, discerning truthfully that which other humans cannot see. The two-shot reinforces this notion, as it suggests a comparison, a kinship between the two objects or people sharing space in the shot. When Frank declares that whatever force killed the man named Martin was “anything but natural” in “Powers, Principalities, Thrones and Dominions,” he is evidencing his sense of “awareness” (after the paranoia and doubt) as referenced in the episode’s opening quote. Frank has begun to detect that something bigger than man is involved in man’s affairs, and that he is, in fact, a crucial player in that supernatural war. This idea represents a huge opening up of Millennium’s mythology, an embrace of religious mythology or “faith” in very literal, concrete terms. But what remains so remarkable about this episode is that Frank’s journey from awkward self-doubt to awakened awareness is charted not just in terms of dialogue or narrative details, but in the director’s artistic and meaningful selection of angles and viewpoints. I often write on my blog that film and TV work best when form follows or reflects content, and this axiom is also true in spades of Thomas J. Wright’s work on Millennium, and this episode in particular. Another way to put it: The teleplay for “Powers, Principalities, Thrones and Dominions” makes Frank aware that there is more on Earth than is dreamed of in man’s philosophy; but Wright’s clever, crisp and expressionist visualization of the teleplay makes the audience actually feel that another world exists side-by-side our own. More than that, Wright’s steady direction shows us Frank’s place within the larger battlefield, and allows us to take the measure of the man. The Devil wants more than anything to co-opt Frank, to turn him to darkness, but the message of “Powers, Principalities, Thrones and Dominions” is that if Frank can maintain confidence in his “gift,” he will see through the Devil every time. 3 Responses to "Thomas J. Wright Week - Wednesday: "Out of Chaos Comes Awareness""
Terrific as always - thanks for writing this up! Now, I want to try and rewatch the episode on its own without Lamentation. Always, always, always a pleasure. Thank you John!